Thassos was a wealthy island, thanks to its gold deposits and the land it owned in metal-bearing areas of the Thracian mainland. It also had considerable potential in agriculture, the most important crop being vines, and fishing. The ease and refinement of Thassian society is apparent from the architectural remains of the Archaic period and later times. The large, populous city was enclosed within a fortification wall that had a perimeter of about four kilometers. 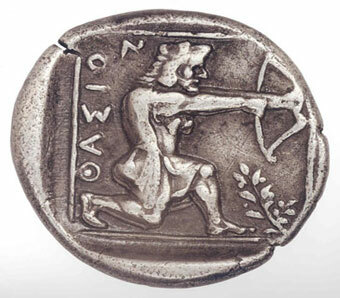 Thassos issued its own coinage from the second half of the 6th c. BC down to Roman times. The depiction of a silenos abducting a nymph on the Archaic staters and on staters and on staters of the 5TH c. BC is influenced by the orgiastic cult of the Thracian Bacchus, who had an oracle on the summit of Mount Pangaion. The sensitive, harmonious movement radiated by the 5th c. staters is comparable with that of the Parthenon sculptures. The monetary reform of the 4th c. BC led to a change in the weight standard, with the staters being replaced by tetradrachms, on which the two patron gods of the city were depicted. The bearded head of Dionysos wearing a wreath of ivy leaves on the obverse is one of the finest examples of the seal-engraver's art. And the depiction of Herakles the archer with a lion-skin headdress and club on the reverse, identical to the one that adorned one of the city gates, is rendered with dynamic realism. The flat tetradrachms with a depiction of the head of the young Dionysos wearing wreaths of ivy leaves and grapes are dated to the Hellenistic period. The reverse of these coins has a depiction of Herakles holding the club. These coins were struck in large quantities and circulated mainly outside the island as an international medium of exchange. They have been found in hoards from the Balkans and Dacia, along with countless barbarian imitations of the type. 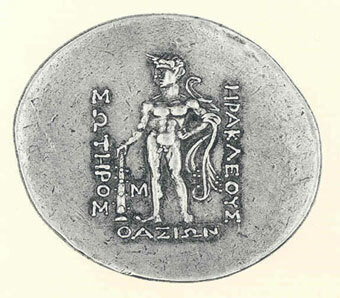 For its local needs, Thassos also issued bronze coins.